Elfinspell: English Version, Carmina Macaronica, by A. Tristellati, vindictae; Adversus Julium Simonem, with a partial English translation by S. Rhoads with a history of hair extensions, a free online text. This pamphlet was discovered and saved by Mike Maddigan, The Industrious Dullard, of Cedar Rapids, Iowa, in the United States. He was unbelievably kind enough to scan it and send the copy to me to put online. An antiquarian bookdealer, he may also have the only copy of it in print. Chivalry and History by non-Knights and non-Academicians, is far, far from dead, as he so generously proves. The translation of the French portion of the text could not have been done without a lot of hand-holding and tolerant, patient correcting, plus invaluable guidance in the art and science of translation, by Bill Thayer. A simple Thanks, seems like a paltry repayment for such kindness, so I am adding a few million Bisous to it. — S. R.
From Carmina Macaronica, Vindictae Adversus Julium Simonem Carmina Latina Prohibentem, Epistolium Ad Radicales, Francportus Hecatombe, by A. Tristellati; Brest : Imprimerie Roger Père, rue Saint-Yves; 1873 ; pp. 7-19. In the Introduction to Macaroneana1, Mr. Octave Delepierre, of the Society of Antiquaries of London, expresses himself in this way : “In spite of the attacks directed against Macaroni poetry, in the name of good taste, men of high intelligence, and who occupy a lofty place in history, amuse themselves with it. They have even gone so far as to to show the greatest enthusiasm for this type of literature.” He then names Cardinal Mazarin, L. B. Alberti, Lorenzo de’ Médici, Bishop Gibson, Naudé, Genthe, Flôgel, etc., and, among the curious and wealthy collectors of macaronic poetry, Charles Nodier, Peignot, and Mr. Sylvain Van de Weyer, the Belgian Minister Plenipotentiary to London. Henry Hallam (History of the Middle Ages), and Baron (History of French Literature), Sainte-Beuve (A Historical and Critical Description of French Poetry to the 16th Century), have remarked that the macaronic poetry favored reform, ridiculed the words of the Church, and served as an instrument of religious opposition. — If this claim were true, it would not be worth our praise; but these one-sided observations seem prejudiced to me. The truth is that the macaronic poems and its orators are met with on both sides, and that their fiery and mocking language must have escalated the controversy. Furthermore, the best models of the type are total strangers to the quarrels of religion. — Arena, J. Germain, Cec. Frey, Geddes, W. King, John Grubb, the anonymous authors 5 of Michel Morin, of the Vœux de nouvel an, of Polkamania (an Englishman),* of the Eulogy to Cheese (a German), Mr. Baron himself, in the Eulogy to a Pig, etc., treated quite different subjects with grace and with success, free from satire and mockery, and simply created amusing pieces, or literary fantasies seasoned with very innocent jesting. ITALIANS. — Bassano, — Tifi Odassi, — G. G. Allione, — Teofilo Folengo, — Guarini Capella, — Egidio Berzetti, — Bartholome Bolla, — Bernardino Stefonio, — Andrea Baïano, — Cesare Orsini (Stopinus), — Ant. Affarosi, — Gab. Barletta, — Part. Zanclaïo, — Giac. Ricci, — J. B. Graseri, — Meno Beguoso. GERMANS and DUTCHMEN. — Several Anonymous Authors. ENGLISHMEN. — W. Drummond of Hawthorden, — Th. Coryate, — George Ruggle, — Edward Benlowes, — Will. King, — Another 6 Will. King, — John Grubb, — Alexand. Geddes, — Félix Farley, — Tom Dishington. 1 Brighton and Paris, 1852, a volume in-8o. 2 M. Delepierre mentions, page 177, a work entitled : A Macaronic Poem in the form of a declaration of war to all the bad paymasters [creditors? ], etc. Paris, 1783, in-8o. — He declares that he has not been able to procure any information on this work, either in England, or Belgium, or in France. The aforementioned poem is by a Sir Margueré, whose name I found in the Bulletin du Bouquiniste; and it was sent to me, at my first request, from the National Library. This is not macaronic poetry at all. It is entirely in French burlesque verse, often rather dull. — I read over it and found nothing of interest there. 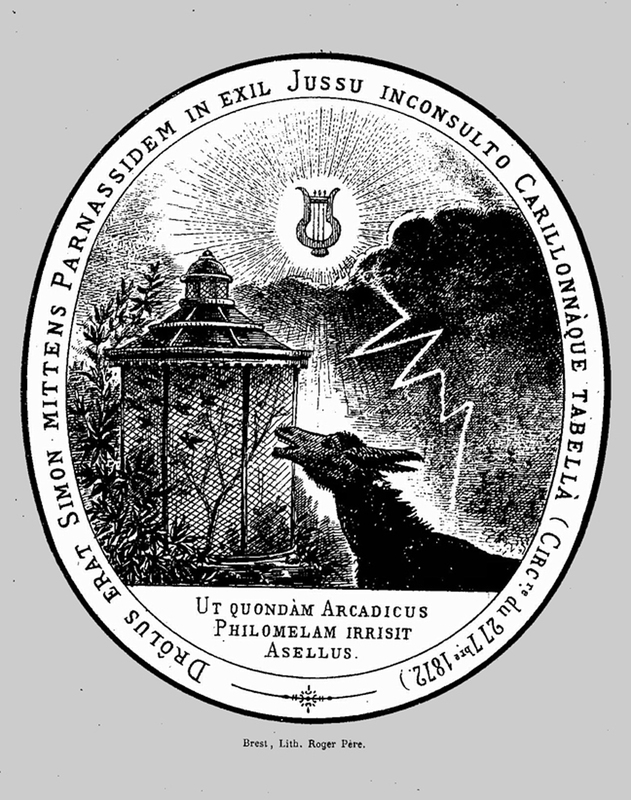 “Mireris jolium quod gessi, Musula, nexum! Et gallans, habili troussatis arte rosettis! Atque blocans fontes Aganippidos Hippocrenes! Væ cui quod renuit! Fourrat sibi doigta per œillos. O nucium cessa, cessa quassator inique! Se pistore fichent, ut se quoque fichat Apollo! Dentibus at totis grinçantibus, — oh! la la! mein her! Phallepa, dironti, mè phallépa, phallèpa kiliai! Pœniteat culpæ promptiûs et validè! 1 The journal Guida del Popolo, printed at Bastia, contains this elegy by Mr. D. Rossi, dedicated to an illustrious French prelate. He has made a separate printing of it, in-8o. 2 The first part of the circular by Mr. Jules Simon has been inserted without a date into the Official Journal of October 2, and the second part into the number for October 3, 1872.
. . . . . You, holy Poetry, gave to our mind a chariot and a mistress; you bend the neck of the reluctant to reins; you add the wingèd sandal to [the feet of] the slow; you educate the rough-hewn; etc. POLITIEN, trans. by Bill Thayer. Jac. Wallius has written a very nice letter in Latin on this theme, addressed to one of his nephews at the start of his studies : “Cur poëtas multi docti homines in postremis habeant; ut rem fastidiosissimam, velut inutilem aut longè infrâ se positam, poësim despiciant, non aliud occurrit certiûs, quâm quod et ipsi absolutissimâ literarum cognitione et ornamentis ingenii atque linguæ, necessariis ad poëticam prœsidiis, careant.” — M. Jules Simon will find this little letter at the end of the Anvers edition, 1699. 4 GOETHE, in Hermann and Dorothea, swears he received inspiration from the nine sisters in turn, he consecrates the nine cantos of his delightful poem to them in the following order : Calliope-Terpsichore, Thalia, Euterpe, Polymnia, Clio, Erato, Melpomene and Urania. 7 Biviatus for bifurcation, seems more exact to us than the expressions trivium and quadrivium, used in the Middle Ages to designate, on the one hand, the study of grammar, rhetoric, and logic; and on the other hand, that of arithemetic, geometry, astronomy and music. 8 This tactic of creating paradox, put in place by certain men in power for some time now, in order to perpetuate themselves in it, has a fatal cleverness. — Indeed, once it is conceived, the party line is promulgated without opposition, its promoter might be the only one qualified to follow it, and so he regulates development and progress by it. Then the best minds must assume the difficulties of taking this step backwards. Thus, the full-fledged paradox endures with its sad consequences. Later, nothing less than the evidence of an impasse, or an imminent disaster, is necessary to decide to abandon it, too late, with the downfall of its inventor. 9 PE-TRA, what thing. — NE TRA, no thing, nothing (Dictionnaire breton-français). “Qui benè castigat benè amat” jâm dixit et alter. 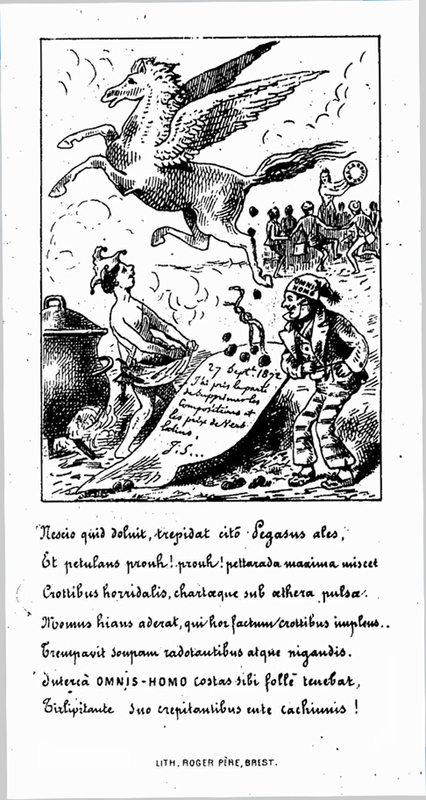 Nox erat; et gilvi sunt omnes noctilè catti! O Radicales! Non mesmas ducite vitas. Singigeni aut homines, tandem resipiscite! Bonsoir! 1 Pantouqueta (Provençal), a drinking song. 3 Nova Crusta socialis, the New Social Class — of Upstarts or Wannabes. Si sortem subitam vellem narrare disertim! Pauca loqaur : Nemorum Nymphæ, diffundite fletus! Vixerunt centum! Nymphaæ, diffundite fletus! Flete, piæ, mecum; Nymphæ, diflundite fletus! Consulit : Hei! damnant Epidauri oracula cunctos! . .
Ah! mecum Nymphæ, nobiscum fundite fletus! Vixit, eheu! vixit delectæ turba Dianæ! Lithograph by Charles Vernier, 1844. 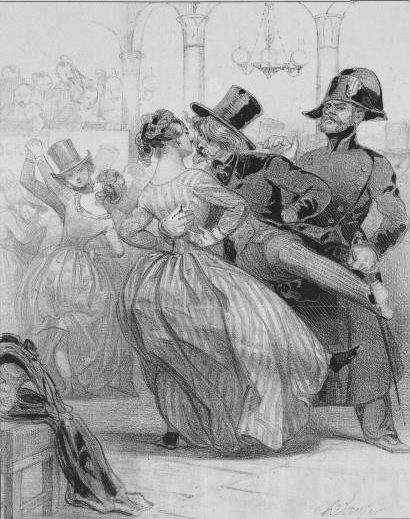 THE POLKA AT A PUBLIC DANCE. A cadenette is a queue of hair, a style worn by men for several centuries. It could appear as a very long pigtail, or braid, worn behind the head. The man who started the style was a Marshal of France, called Honoré d’Albert, Lord of Cadenet (1581-1649). In the 18th century the style was resurrected by military men and worn by them for centuries. The French infantry was the first to adopt it. The term later seems to have included different styles of braids and lovelocks worn by both men and women in other walks of life. The simple cadenette was expanded and embellished over time, of course. It could be interwoven with ribbons, powdered and added to wigs, worn loose or pinned up, etc. Les Oublies, by Baron François-Joseph Bosio (1768 -1845). Courtesy of La Mesure de l’Excellence. 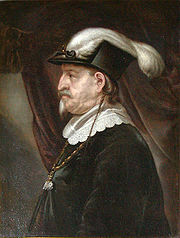 Christian IV, by Karel van Mander. “Whatever happened to cadenettes?” you may ask. They are alive and well in the 21st century in a new guise, with a new name: hair extensions. But the old French name is much catchier!